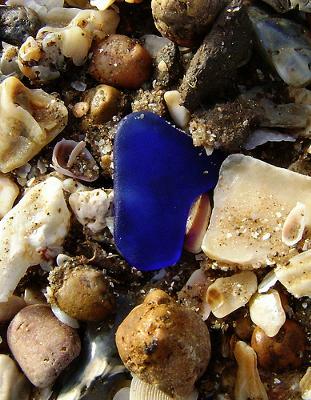 I also found a similar cobalt piece at Sargent Beach 3 years ago. I am here now and walked the beach at low tide and found very little glass, nothing worth picking up except to throw in the trash. The landscape has changed dramatically since Hurricane Harvey. It’s flatter and there is less glass. What I love about this photo apart from the beautiful specimen, is the natural setting the specimen lies in. Great shot of a great piece. Thank you.